The Doge goes rogue: Christmas Revels sails to Renaissance Venice! A street festival in a Venice Christmas Revels show in Portland, Oregon. Courtesy of Portland Revels. It’s the height of the Renaissance, and Venice is bursting with excitement. In this bustling maritime hub, La Vigilia di Natale (Christmas Eve) is fast approaching, and the city is preparing its annual Feast of the Seven Fishes. A thousand details must be settled, and they all seem to land in the lap of the Doge (pronounced “dohjz”), the city’s overworked top administrator. Deciding he’s had enough,, the Doge goes rogue! Crying out “Basta!,” he casts off his corno ducale (that special hat the doges wore), leaves matters in the hands of his power-hungry magistrate and, disguised as a commoner, falls in with a tatty troupe of traveling comedians. Will the comedians land the festival gig they hope for? Will the Doge rediscover the beauty and magic of the city he serves? Will the magistrate get the comeuppance he deserves? This painting, “Galileo Galilei showing the Doge of Venice how to use the telescope,” by Giuseppe Bertini, depicts a 17th-century scene. So begins the funny, relatable story told by The Christmas Revels: A Venetian Celebration of the Winter Solstice—a high-energy, two-hour show combining clowning, singing, dancing and instrumental music largely from Renaissance Venice and Italy. The show takes place Thursday through Sunday, December 13-16, in Spaulding Auditorium of the Hopkins Center for the Arts. It’s the 44th Christmas Revels in Hanover, produced by Revel North, an Upper Valley non-profit arts organization providing year-round, multi-generational programming that celebrates the power of traditional song, dance, storytelling and ritual. Gloriously costumed as the nobles and working classes of that time and place, the 60-member, multi-generational cast performs songs ranging from the fine choral music of Monteverdi and Palestrina to rollicking Italian folk songs of fishing, courting and drinking. They weave in dances from Renaissance Italian nobles and ordinary people. Heading the cast is Norwich resident John Severinghaus (last seen as Benjamin Franklin in a hit production of 1776 at the Briggs Opera House in April 2018) playing the Doge, with Nils Fredland, Artistic Director of Revels North, stepping forward to lead the audience in sing-alongs at various points in the show. The script was adapted from one performed last Christmas by the Revels in Cambridge, MA. Dnacers in a Cambridge Revels production of the Venice show. Noted the guy in the Doge hat in the rear. Courtesy of Revels, Inc. The local cast is joined by four guest musicians who, collectively, have toured the world playing early music with groups like Cirque du Soleil, on such instruments as lute, viola da gamba and Renaissance wind and percussion instruments. Wayne Hankin with one of the many instruments he plays. Photo by Roy Volkman. This year’s guest artists are primarily based in Vermont but perform well beyond it. 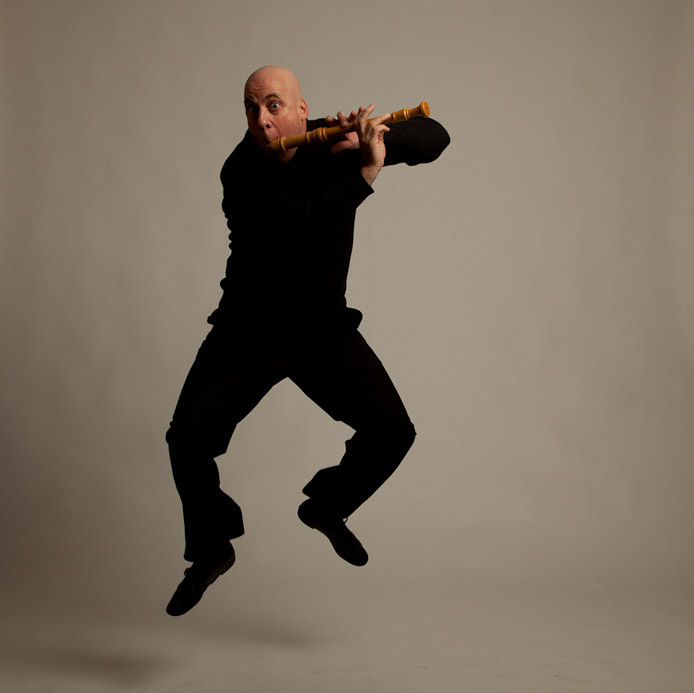 From Newport, VT, Wayne Hankin, best known for his work with Cirque du Soleil, is a period instrument specialist who has played 400 different instruments over a 30-year career that has included 4,000 concerts in every major North American city and countless venues worldwide. His varied career includes hundreds of performances for leading theater companies, appearances on television networks CBS, ABC, NBC, HBO, MTV and BRAVO, and has received numerous awards and commissions from ASCAP Awards to the National Endowment of the Arts. John Severinghaus as the Doge in Christmas Revels. Photo by Evan Oxenhandler. From Bellows Falls, VT, Laurie Rabut performs widely on period string instruments in New York and New England, with ensembles that include Boston Camerata and Boston Baroque. South Royalton’s Christine Rua, who plays wind instruments, bagpipes and percussion, recently completed a 10-year, 25-nation tour with Cirque du Soleil. Based in Boston, lutenist Douglas Freundlich has performed with many leading ensembles over the years, including the Boston Symphony, Boston Baroque, Emmanuel Music and the Cambridge Revels. Exploring a different culture and time period each year, each Christmas Revels is made up of diverse, culturally informed music, dance, storytelling and costuming, with a large cast of local and guest performers. Recent shows have traveled to Colonial Quebec, Nordic lands and Ireland. The Christmas Revels is a joint production of the Hop and the Upper Valley arts organization Revels North, which provides the community with the opportunity to connect in meaningful ways as it brings traditions to life through music, dance, song and theater, in programs throughout the year. As with every Christmas Revels, this one is based on a real time and place but with fictional characters and events. This one aims to capture–freely–Venice around the turn of the 17th century. Founded in the 5th century on a group of north Adriatic islands and mudflats by people fleeing attackers, Venice by 1600 was about the same acreage and population as London and, thanks to its traffic from the Mediterranean, was a melting pot of cultures from elsewhere in Europe as well as the Middle East in North Africa. This combination of influences was reflected in the staggering beauty of such buildings as the Basilica of San Marco, Rialto Bridge and the Palace of the Doge and in the music being made in churches, academies and grand homes as well as by the gondoliers, workers and tradespeople. It was an independent republic, overseen by its doge–like a mayor, but elected for life by representatives of the the city’s wealthiest and best-known families. The six performances take place Thursday, December 13, 6 pm; Friday, December 14, 7 pm; Saturday and Sunday, December 15 & 16, 1 pm & 5 pm.Tickets on December 13 are $25-46 for adults and $8 for ages 18 and under, and for other performances are $27-48 for adults and $11-20 for ages 18 and under. The Christmas Revels is a production of Revels North, a grassroots community arts nonprofit organization founded in 1974. Revels North provides the community with the opportunity to connect in meaningful ways as it bring traditions to life through music, dance, song and theater, in programs throughout the year.